Even if nobody used it at all it would be an improvement for sidewalk users to have a safe buffer zone between them and traffic, and nearby residents would benefit from the marginally slower traffic speeds that would occur if drivers were confined to two slightly narrower lanes rather than 3 wider ones. But reality is that they would be used, by lots of people. Certainly more people than currently use if for parking, even if less visible. I'm a cyclist and bike commuter, albeit not on that route, and I don't think the route needs to be on 109th. As a commuter route there is little practical difference between 110th and 109th. For business access it's only a block of 109th so it facilitate that just fine as well. It does need to tie in seamlessly to the high level bridge, and it needs to continue south of 76. 109 is the option that does that best. Good thorough design could make 110th work very well and a High Level connection at 88th Ave already exists fairly well, and an interseection re-design to a degree might be needed for some bike-jump signals. 110th could work well with some stop sign adjustments, an improved traffic light at Whyte Ave, and some traffic islands at both 88th ave and at 76th ave as the route would head further south along 11th st.... it would have to connect I guess to 111 shared-use path south of 61st ave somehow though. That's the major issue. Will it be thought of as a small segment, or as a part of the wider network for future expansion? 109 st could look like Great Northern Way in Van which is a busy trucking and commuter road with a new treed boulevard and 2-way separated bike path with adjacent sidewalk. Easy. Everyone wins. Compliment with zoning and design guidelines for new development. Agreed. I've been a cyclist for a long time and find it funny hearing most complaints from other cyclists. Especially when they make fun of drivers who can't be inconvenienced with an extra minute of delay because of cyclists but then turn around and complain if they have to take an extra minute to cycle an extra block like it's the end of the world. I just think if the city is trying to encourage cycling it should be highly visible (i.e. not shuffled to side streets), lanes should be added in high-demand areas, and driving lane demand will need to adjust. Also, 1 minute in a car in inclement weather is substantially different from 1 minute biking (or walking, for that matter) in inclement weather. Not to mention the 1 minute delay for bikes option still makes them cross a busy thoroughfare without additional safety measures added. 110st works. There is already a bike lane on 106st, so 108st wouldn't make much sense? 109st, I don't know why you would want to bike on it other than to specifically try and calm traffic. 110st or 108st is much more pleasant. For longer commutes that come from south of 76ave there is a practical difference. There's also the pathetic way that other so-called bike routes have been maintained in the area. There's a signed route on I think 113 that is nothing bit signs and one or two paved lane sections. The crossing at 72 is a beg button and a standard crosswalk despite 72 being re-done last year. 110 would likely be the same; there's an existing bike lane on 110 in garneau that's way too narrow and some of the worst pavement anywhere. And since winter maintenance is one of the main benefits of proper bike infrastructure for seasoned cyclists putting it next to a main road ensures that it will be maintained in the long term. The resistance to a bike lane seems like intentionally refusing to offer anything but scraps when there's so much underutilized space. Calming traffic on 109 is a very worthy goal, and just a few months ago the city started consultation with that in mind - and that consultation apparently was strongly in favour of bike lanes on 109. I bike home that way about once a week lately. Getting from the LRT path going down 111st to 110st would be pretty easy with some minor upgrades. Because 106st is under construction south of 76ave, I've been riding down 108st. The part that doesn't work is getting from the north side of Argyll to the east side of 109st. Bike lane down 110st to 76ave should work excellent. caught the 6pm CTV news yesterday and there was a business owner on 109 Street who had a letter signed by 20 other businesses on 109 Street or very close to it, who are against putting a bike-lane on 109 Street. They said it would negatively affect their bottom line with limited parking around the area. There is no calming required whatsoever as it is already snarled beyond belief. The last thing people who live and commute by vehicle from Southwest Edmonton (the overwhelming vast majority of citizens as it seems that fact escapes your comprehension) is another 99 Street and Calgary Trail mess between Saskatchewan Drive and Whyte Avenue. Get a grip. Even if bike lanes were added to 109st, if your concern is between Sask Drive and Whyte, there would likely be little to no change other than losing the under utilized bus/taxi lane on the northbound portion. That said, I would personally prefer to, and already do, bike off of 109st. Preference is one consideration. Another is what the bike lane would do for potential businesses along that East side of 109 between Whyte & 109. That section is ripe for redevelopment with the boarded up Mucho Burrito, closed church, parking lot just North of TD Bank, etc. If memory serves, the Knox Metro Church site is becoming a condo building, right? Seems like a slam-dunk to have a connected bike network right outside that isn't even removing parking spaces. Does more vehicle traffic help that redevelopment? The past 10 years of virtually no progress along that strip seems to indicate that no, it does not. Add a bike lane, relax parking restrictions on side streets to accommodate businesses, and it's all upside. Although to get the seamless tie into the High Level Bridge mentioned earlier the route would have to be on the west side of 109th. Otherwise you have cluster getting across 109th where it bends down Walterdale Hill. When I've cycled from DT, at the south end of the High Level Bridge I just swing west to get to 110st and follow that all the way south to 63rd ave. Works very well as it is. Once at 63rd ave I cross over I use the shared path to the pedestrian bridge over whitemud, from there is all the way south. Sounds like we have a defacto bike path already in place for 110st/ 112st . As much as I enjoy cycling in the warm weather, not every major road must have a bike path. Leave 109th alone, cars, trucks, buses etc all use that corridor. A stop light and signal phase change would be necessary, so it wouldn't be free flow, but I don't think that's so complex that it's impossible to overcome. I agree that cycling routes that flow nicely would be great, but it's all about money. The city will not spend a fortune for the small amount of cyclists. Comparing the routes and conveniences that cars have is apples and oranges. On any given major route, the amount of cyclists compared to the amount of people in vehicles including busses is not even comparable at all. Even if the amount of cyclists increase dramatically, it still wouldn't compare to those commuting in vehicles, so the amount of time and money to spend on cycling routes needs to be comparable to its volume. It's far easier and cheaper to paint a bike lane on a lesser-used sideroad than to rework a bridge that crosses the river. It's just common-sense really. Any future bike lanes would not simply be paint on the road, and if built on 109st it would be a part of a grander scheme all ready in place to rebuilt the sidewalk and public realm. Built in tandem as a part of the 109st redevelopment. 109st is being changed in any case so it's thought to pair this cycling track as a part of that greater dialogue in design of 109st. Ridiculous, as there wouldn't be any parking removed if they put it on the East side of the street. Also, its way easier for someone on a bike to stop and find parking to visit a business. Do they think cyclists don't spend money? They're going to park their car over there. You're going to park your car over here. Get it? That petition smacks of Envision Edmonton. How dare these businesses make more money! Using 109th street south of high level for bike lanes is a foolish idea at best. I don't know what is with this city administration... instead of creating transportation networks in harmony with each other, they seem to prefer the idea of pitting one against the other. It's a brain-dead idea, when one can easily use 110th street without taking away parking or driving lanes through a busy commerce area. Before you respond that I'm some car driving suburban person, realize that I ride to work nearly daily, and probably ride more kms per year than you have in your life. It is true that once could easily transform 110th st from 76 ave to the High Level Bridge to a valuable and good piece of cycling infrastructure, but I think the conversation on the two routes is whether the intent is to also consider the route beyond 76th ave (ease of thru-access and connections), as well as the general transformation of 109th street. Really kinda depends on if that business is a Starbucks or a Bridal Shop. Also if you provide parking that gives you access to a bigger radius of people. If I open a food establishment on 109 Street with no parking (or next to impossible to find parking), I kinda doubt those Westenders are going to bike/bus over. But if a cyclist isn't willing to walk one street over for the food (the food must not be very good). The neighbourhood has ample free parking. We would like your feedback on cycling in Edmonton. 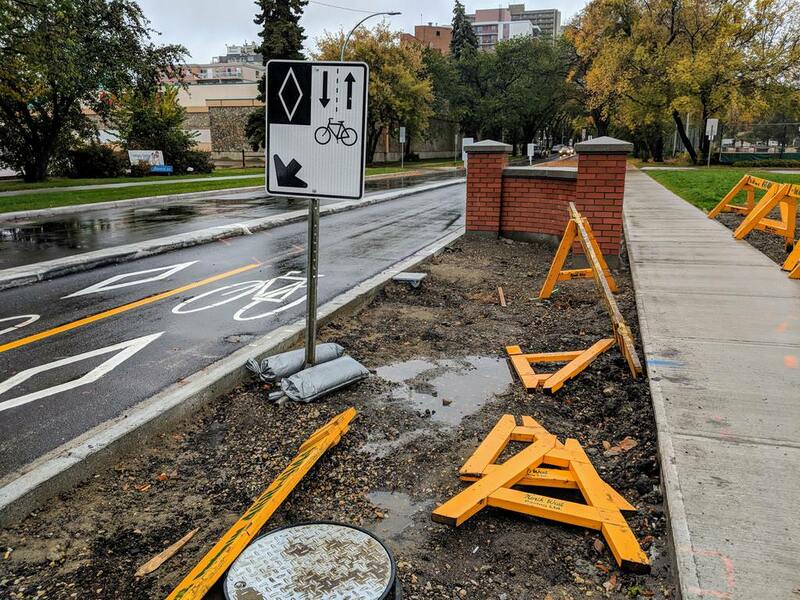 Researchers from the University of Alberta are conducting a study on Edmontonians' perceptions of cycling in different environments. All residents of Edmonton are welcome to participate whether they currently ride a bike or not. They have a good section about comfort levels riding using videos to illustrate the situations. The new bike lanes on 83rd Avenue between 106 Street and 111 Street are open for business. All that seems to be left is a little landscaping in a few spots. All the wet weather has allowed the newly-laid sod to take very well. The lanes themselves look great. There's also a new set of pedestrian-activated traffic lights at 83rd and 109 Street with brick crosswalks. Looks good and is far safer than what was there previously. Overall everything looks great, seems to be a wonderful addition. I do wish that it would have extended all the way to 112 street though. I hope there is enforcement with fines for misuse of these signals for people who do not dismount. Why do they need to dismount at a protected, separated cycle track intersection? Because it is a Pedestrian-activated signal. I know this escapes the comprehension of many cyclists. It is not a way to snarl traffic beyond what has already been inflict on drivers by cyclists. Why should cyclists dismount if they aren't using the crosswalk? If they activate the Pedestrian signal as they repeatedly do all over the City they better dismount. You know, I see drivers who take advantage of a pedestrian pushing the button at a crosswalk all the time, sometime even having a passenger get out to push the button and I've never seen a single one get out an push his or her car. I don't understand why a cyclist should be treated any differently. Both should be fined. My experience is that cyclists are the #1 offenders and the last thing we need is more snarl on 109 street. My experience is that cars get in the way of other cars far more often than cyclists get in the way, and that the lights timed for cars at 82 ave cause queues back past 83ave fairly often. Adding a timed light to allow safe crossing of 109 will have no effect on motor traffic other than making it harder for them to illegally enter the 83 ave intersection when they're unable to clear it and harder to illegally not yield to pedestrians crossing 109st. Also, you may have noticed that there are hundreds of locations in this city where traffic lights are triggered by detection loops in the pavement that detect cars, ensuring that people in cars get a chance to proceed in a reasonable amount of time. Very few bikes have enough metal in them to be detected and you would probably be livid if one rode up to a red light in the part of the street where they might have a chance. For a person on a bike refraining from pushing the button to avoid "snarling" traffic is pretty much like someone in a car intentionally stopping at a red light behind the detection loop to avoid triggering the signal and "snarling" traffic. When was the last time you saw a driver do that? Also, at the flashing yellow pedestrian crossings do you particularly enjoy waiting longer for a dismounted bike rider because you revel in their inconvenience, or would you prefer they ride their bike and clear the crossing faster despite it violating the letter of the law? Only the second option is rational. I wasn't there for long but as far as I could tell the 83rd Avenue lights were completely synchronized with the 82nd Avenue lights. I doubt these new lights will affect traffic flow and they were badly needed for pedestrian safety. I wish they would have added activation buttons specifically for use by cyclists. I was brought up to dismount and walk my bike if I wanted to use a crosswalk. 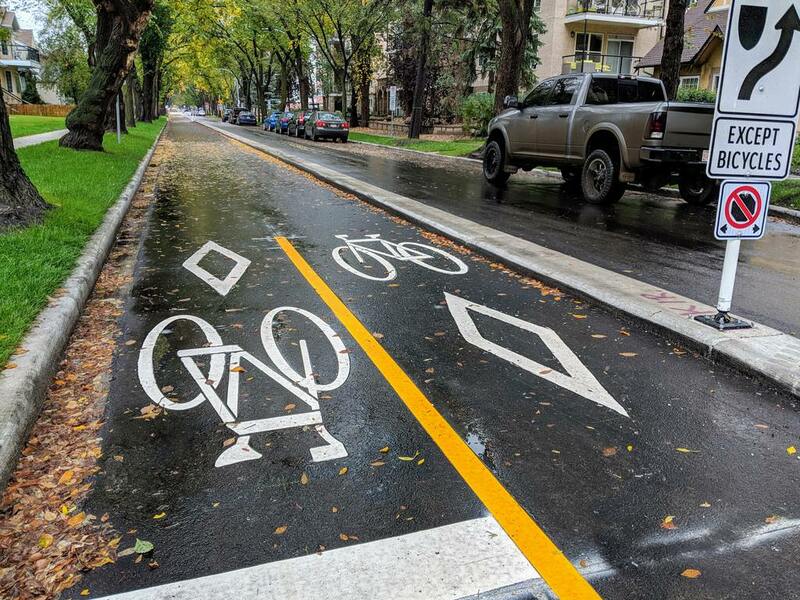 I always respect that and stop for both pedestrians and dismounted cyclists (I drive Saskatchewan Drive to work every day and stop for dismounted cyclists every time; those who try to ride through a crosswalk get no leeway and a loud horn if they do). The fact that you seem to think you are special is what is wrong with the whole approach that this misguided administration and city council has taken. This is not a amber crosswalk. This intersection is a traffic light controlled intersection where cyclists, pedestrians, and cars will cross 109 street on a red light, or when safe proceed through the stop sign. I was brought up to not blare my horn at other road users unless they were creating imminent danger. You don't need to stop or yield to a cyclist who doesn't dismount but the horn is just you being disrespectful. Therefore, only if a cyclist dismounts and is therefore considered a pedestrian and not a vehicle by law, do they obtain the right-of-way over motorists. If a cyclist chooses to ride their bike along the crosswalk, they are considered a vehicle. The crosswalk only serves to provide protection for pedestrians. This does not excuse vehicles from exercising due care and taking reasonable efforts to avoid collisions (regardless of right of way), but they are not legally obligated to yield to a cyclist who rides through a crosswalk merely because of the presence of a crosswalk. On the other hand, other controls, such as a yield or stop sign, would still require a driver to yield to both pedestrians and cross traffic, meaning even without dismounting a person would still have the right of way over vehicle traffic. So you want Cyclists to dismount and take longer to cross the road? Which is in opposition to your concern about increased traffic congestion. My guess is that the 109 st crossing will have the same bike detectors that were placed on 99 st. A bike goes over the detector and then the light will change for them. For now, their only option is to press the button, and once they proceed they are doing so as a vehicle, not as a pedestrian. You are correct that bikes should be walked across a normal crosswalk. What's the bike count today? I was out and saw few others though. I actually think the count is higher in mid-winter when people have their winter bikes and gear ready. This is so abnormal for this time of year most who ride in the winter weren't ready for it. Or thought they weren't ready for it. The reality was the riding wasn't bad. No ice, just wet so like riding on a rainy day except cooler. 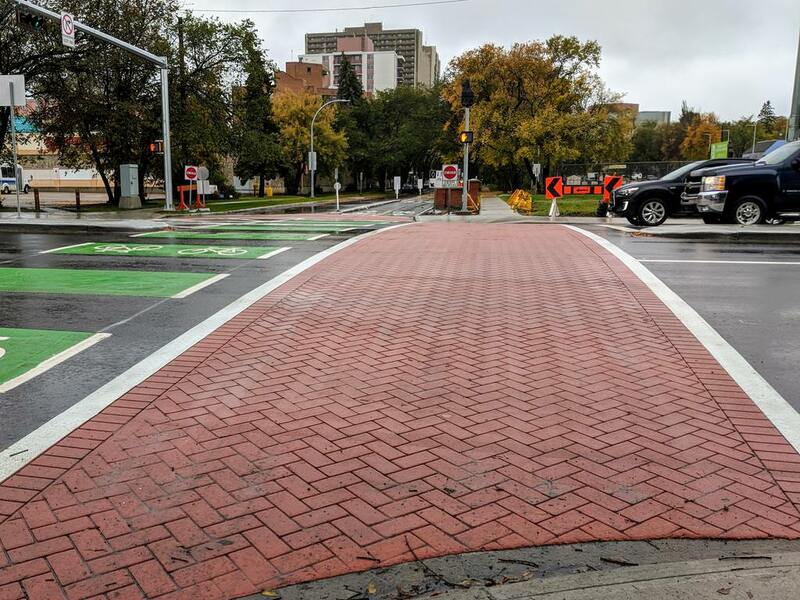 There is currently no section in the Edmonton Traffic Bylaw 5590 or the Alberta Traffic Safety Act specifically dealing with cyclists in crosswalks. Cyclists are not legally required to dismount at crosswalks and there is nothing to prohibit a cyclist from riding along a crosswalk. The interesting thing here is that while there is nothing technically illegal about riding your bike in a crosswalk it is against city bylaw to ride an adult sized bike on a sidewalk. Yet it seems what people get up in arms about the former far more than the latter. On the practical side if you are riding on the sidewalk it makes a lot of sense to dismount when crossing or, at the very least, treat it as stop sign. Even a cyclist moving at moderate speed could be seen too late for a driver to brake in time. drivers need to come to a full stop, at the stop line, not the middle of a crosswalk before proceeding with their next movement. Thats where the majority of problem occur, drivers ignoring stop lines. Last edited by Medwards; 22-09-2018 at 11:37 AM. Your view on this is outmoded. A cyclist should walk their bike across a crossing if they happen to be on a sidewalk. If they happen instead to be going through the crossing on a designate multiuse/bike path they should not have to dismount. Every cycling season I encounter several drivers like yourself that honk their horn or yell abuse because I didn't dismount and I carefully crossed the crossing with the walk sign visible ON a multiuse path. It seems some drivers are still working off a 1970's driving instruction manual. Multiuse paths have existed in this City now since at least the 1970's and you swear from driver reaction that its a new innovation. I do think as well that most of the driver frustration and abuse directed is primarily due to drivers choosing a mode of transport that is just much more frustrating. Albeit cycling in this city is plenty frustrating as well when interaction with some drivers is involved.. I counter this though by waving thank you to any driver out there that does even spot a cyclist using a road adjacent multiuse path. I appreciate that some drivers are even aware of cyclists occupying adjacent paths. Last edited by Replacement; 22-09-2018 at 12:24 PM. The other reason why a cyclist should dissmount their bikes and walk them while crossing a cross walk with 4 lanes, is because the last lane ahead is often a right hand turning lane. Maybe the adjacent vehicle in a right hand turning lane is a blind spot to a higher profile vehicle like a truck. I've seen vehicles in the turning right hand lane just whip by without checking. So, here's what I witnessed the other day on 99 st and Whyte Ave. Vehicle is facing South on 99 st, turning East onto Whyte Ave. There's 5 seconds left on the walk signal (before the light changes) - there's no traffic heading North on 99 st, and no pedestrians crossing. The vehicle starts to turn when all of a sudden there's a cyclist heading South using the crosswalk, and he nearly got hit by the vehicle turning. Who is at fault? Drivers do not need to come to a full stop when turning on a green light or on a yield sign. A cyclist on a sidewalk can easily be moving fast enough that a driver will not see them in time. As an example, while cycling on a road I was about to turn right, I looked right first to see if any pedestrians were crossing then left for any vehicles. As I started to move two cyclists at speed almost hit me in the crosswalk from my right. They were moving fast enough I didn't see them on my first check. Can't comment on others but I go only on a fresh green, with walk sign, if anybody is turning. If intersection is clear of left or right turning vehicles I do proceed still with stale green light if safe to do so. Ultimately its up to the cyclist to look out for their safety just like a pedestrian. You can't assume it. Note that I don't think it is fair, courteous, or sharing the road for pedestrians or cyclists to prevent turning vehicles by going on a stale green. But if nobody is turning and I have green I'm not delaying anybody. Last edited by Replacement; 23-09-2018 at 11:16 AM. The trails around Rossdale/the power plant are finally open again. Went for a nice long ride yesterday from the Walterdale towards the funicular. Too bad the trail connections at Louise McKinney are still closed. The bush and assorted foliage that has been existing there for decades along the West side of the tracks from Clareview station to Belvedere has been cleared. I'm hoping the City will install a multi use pathway, that will connect Clareview station to Belvedere station. ^ Hopefully. That pathway is long overdue. Time for Edmonton to get a central bikeshare. That's great to hear, but we need central options for hotel guests, conference folks, commuters and short daily trips ie. meetings etc. Not to take anything away from RC, but there is a real need for a bikeshare. Once in the core, people can they take the LRT, take a cab, take Uber, take a bus, walk, etc. For several decades when I worked downtown I either caught a ride or later took my own car and parked it. So to get around downtown I usually just walked. Moreover, if it’s a need for visitors, then without a doubt they could afford a rental. In fact they would prefer a rental due to all the other conveniences that come with renting any product, like cleanup, assistance, maintenance, stock of helmets, etc. Last edited by KC; 02-01-2019 at 01:10 PM. We do. Put your bike lanes in, get a bikeshare, make it cheap/convenient/easy, go. Bike share is a much more tourist-friendly option as it allows for virtually zero pre-planning, lets people explore vs just seeing the city through a window, is active, contributes actual people as active participants to the streetscape, etc. Autonomy is important when exploring a new city. Bus & LRT don't go everywhere. Bikes pretty much can. Who would pay for the abuse of the system? What kept Seattle’s Pronto! bike share program from thriving? Turns out it was several things. I think it’s a great idea as long as it isn’t severely abused and doesn’t require a lot of taxpayer money. Taxpayers are already footing the bill for the core infrastructure. So the freebies should stop at some point. Last edited by KC; 02-01-2019 at 01:28 PM. Companies such as LimeBike etc. are ready to make a proposal to the COE and get things going, but they need an understanding of the requirements/constraints/conditions etc. Can’t bicycle rental’s serve the same purpose? Also, don’t such services steal customers and ridership away from other services? That’s fine if it’s private sector competition but for taxpayers to subsidize one service at the expense of another subsidized service could be costly if it didn’t create other synergies such as an overall boost to tourism, longer stays, etc. ...it is a bike rental. It's just far more available and with virtually zero barrier to entry. It'll steal short ride customers from taxi companies/uber/transit, but likely not enough to make any difference. it would be easy to say the taxpayers already subsidize some services over others, starting with bus and lrt which steal customers and ridership away from private vehicles (owned and taxis and uber etc.) and moving on to streets themselves which can be said to subsidize private vs public modes vs pedestrian/bike traffic. it's all subsidized - how much probably depends on whose ox is being gored at the moment by which one. If they don’t steal much in the way of customers of taxi companies/uber/transit, then are they creating a new market or taking away pedestrians? Last edited by KC; 02-01-2019 at 03:26 PM. Right again - as always. Last edited by KC; 02-01-2019 at 03:22 PM. Zero tax dollars for this nonsense. The intent and contemporary model is for it to be a private venture, with the City acting as a facilitator and regulator at the outset. How much more motor vehicle unfriendly can the City make the Downtown? I'd definitely be up for a bike share location somewhere downtown. I have a steep uphill climb from the river valley to contend with, so this would be great for errands and not having to drive a car. i've long said that if you have a bike it should be considered a valid transfer or fare on ets. that way you could bike to the river valley, take a bus down and back up the other side, and then bike the rest of the way. no one is going to cart a bike around just to avoid a transit fare so i don't think there's much potential for abusing the system and it would eliminate that one real bottle neck/impediment you identify from the system. if transit is supposed to be integrated, this would go a long way towards implementing exactly that. On that note, nothing like being on the train at rush hour and having them kick people off who are trying to board with a bike. How is that the policy? I understand that it's busy, but you can't promote bikes while also making it harder to bike to work. This city needs to actually think through some of this stuff. That actually makes some sense to be very honest with you. This isn't about making things more vehicle unfriendly, but rather better supporting the infrastructure we all just invested in, WHILE providing more economical, healthy and convenient way for us ALL to get around in Central Edmonton. I don't think you understand the concept, but adding bike share doesn't make anything less motor vehicle friendly. And regulation and facilitation can be incredibly cheap and easy - I think that a city that manages to facilitate and regulate motor vehicle traffic on parking on every single street can manage to do the same for a few hundred bikes. I get it from a capacity angle, but it's disjointed at the very least. I understand the concept entirely: a vocal minority has seized control of an agenda that they push on spurious grounds for which they get the majority to subsidize. If one lives outside of the downtown there is ZERO desire to come there other than to work because of the bias against motor vehicles upon which the overwhelming majority rely for their non-work transportation. Might as well go elsewhere to shop, dine or go to a movie. Rogers Place at present is not much of an attraction except on game or event days. 2. Downtown Edmonton is still relatively easy to get to and from, with ample parking and while there is a reasonable amount of disruption at the moment with LRT construction/105 Street super line, it still works 95% of the time. 3. Bike share should impact vehicle use no meaningful way and perhaps even remove vehicles from the roadway as it would now be a viable option for people going to and from Whyte or other central quick trips that might be slightly further than people want to walk. 5. Have you used the community rink for a skate, hockey, rent it for a corporate family skate? *until Ice District Plaza opens. So which iteration would be best for Edmonton? Ian, I am going to be blunt. For someone who lives downtown and who doesn't have to run the daily commute gauntlet from elsewhere to go to and from work downtown you haven't got a clue. The last place on earth I want to go to in my leisure time is downtown. Having to face even more self-righteous cyclists disobeying traffic signals, riding on sidewalks and thorough crosswalks just doesn't appeal to me and countless others. It's about time you started thinking about all of the businesses and people who work downtown a little more seriously. I live pretty much as far away from downtown as you can get while still being in the city, and I'm downtown all the time for work, recreation, just for dinner, etc. It's a commute, but it's easy. May I suggest not viewing everybody encountered on your route as someone in your way, and instead as someone also trying to get somewhere? In a City where you can get in and out of Downtown in rush hour with barely waiting more than one light cycle, that seems spurious at best. Percy, I am going to be blunt. I want efficient and easy access to Downtown for ALL users. There is ZERO benefit to make it difficult for anyone to get Downtown and if anything, we need to make getting to Central Edmonton intuitive, easy, and as painless as possible given the vast amount of other options. BikeShare is far less leisure than a viable, practical modal option for many. Sure tourists will use it, but it fails if it is not first and foremost a way of daily transport for more people. Do we need to work on sharing the road and respecting others while using whatever mode of transportation we choose? Absolutely. This morning on my 6 block walk to work I was nearly hit three times by cars. THREE. If you are concerned about that at all, I am concerned that you are not fully aware of what I am aware of and the priorities/focus that I have. As always, happy to chat more in person to share concerns, ideas, opportunities. Especially in the summer I'd be interested in parking a bit outside the core and grabbing a bike to the office. Avoid any traffic snarls caused by accidents and whatnot, and the cost vs parking would be a game changer. Many of us who work Downtown regularly have meetings slightly too far to walk, but end up cabbing or driving. A bikeshare would allow us, yes even in suits like you see in NYC, Copp, Tor, Otta, Cal, etc. to take a quick ride, drop the bike and be there in just a few minutes. At the outset, or from the outset? Last edited by KC; 03-01-2019 at 09:33 AM. This cracked me up! Basically what you are saying to Ian is: "why don't you start thinking about other people while I only think about myself". Last edited by KC; 03-01-2019 at 09:40 AM. Obviously it would be dockless bikes - or at least it would be the bikes that have the smart hardware, not the docks. I like the way hamilton' bike share works with official stations where you can go to find a bike but where bikes can be left nearby if the station rack is full, or anywhere else for a small fee (like 25-50c). Docked systems can have problems when the dock is full, and it seems like fully dockless have issues with sidewalk clutter, so a flexible-docked system seems like a good compromise. What's wrong with taking the bus? Don't get me wrong, I'm all for active transportation and bike share, but this reasoning is silly at best.